Jane Bloom Grisé is the Director of Academic Enhancement and Assistant Professor of Legal Research and Writing at UK Law. Prior to joining UK Law, she was in private practice specializing in international adoption law. Before moving to Lexington, she was an Assistant United States Attorney in the Southern District of New York. As Deputy Chief of the Civil Division as well as Chief of the Civil Rights Unit, she handled complex civil rights cases initiated by the United States as well as a variety of civil litigation and appeals. Before joining the U.S. Attorney’s Office, she served as Managing Attorney of Mid-Hudson Legal Services in Poughkeepsie, New York. In that office, she handled trial and appellate cases in all New York and federal courts. In addition, she litigated and argued Juidice v. Vail before the United States Supreme Court. Before joining Mid-Hudson Legal Services, Professor Grise served as a Law Clerk for Judge Jack Day at the Ohio Court of Appeals. Professor Grisé shared that when she went to law school at the University of Wisconsin, her class was comprised of 5% females and there was one female law professor. Her law school experience and career were full of twists and turns, all of which led her through her comprehensive professional and personal paths and on unexpected adventures. Retired judge Janet Stumbo is a UK Law graduate and is the first woman from the 7th Appellate District to be elected to the Kentucky Court of Appeals, where she served from 1989 to 1993. She was then the first women elected to the Kentucky Supreme Court, where she served until 2004. Judge Stumbo was elected to the Kentucky Court of Appeals for a second time in November 2006 and took the bench on January 1, 2007. She was re-elected in 2014 and retired from the bench at the end of 2017. David A. Brennen, dean of UK Law joined the Women’s Law Caucus in this celebration of women in the legal profession. He informed attendees that UK Law’s student body is at the highest percentage of women that the College has seen in the past 10 years at 47 percent. “We are also experiencing growth in the percentage of women who are in leadership roles within our student organizations, this academic year having 18 women serving as president out of the 29 active student organizations,” said Dean Brennen. Beginning at next year’s Women’s Law Caucus Spring Luncheon, the Rebecca Westerfield Award for Excellence in Leadership will be awarded to a rising third-year law student who has demonstrated excellence in leadership on campus, in the civic sphere, in the arts or in scholarly research and writing. Rebecca Westerfield is a 1975 graduate of UK Law and is a former Jefferson County Circuit Court judge. She moved to California in 1992 and became a founding member of JAMS (Judicial Arbitration and Mediation Services) on whose Board she now sits. The annual celebration of the contributions of women in the legal profession is one of the organization’s largest, most successful events of the year. 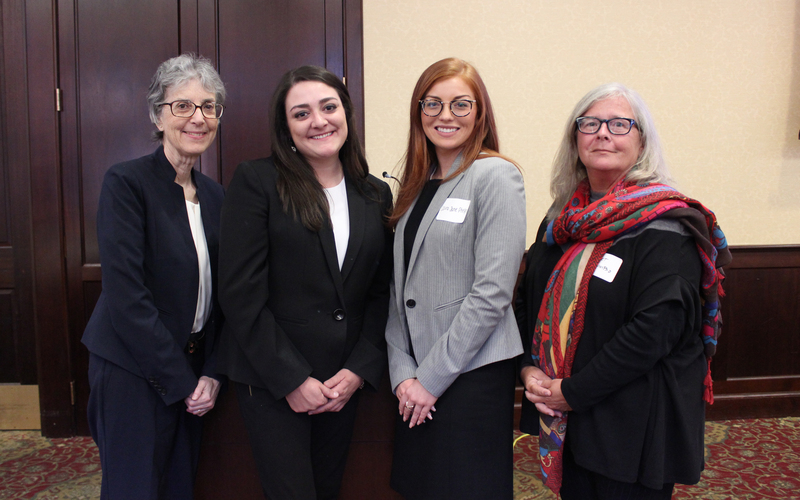 The Women’s Law Caucus is a student organization at UK Law devoted to celebrating and fostering the contributions of women in the legal field. They lead a mentorship program with area attorneys, bring awareness to domestic and sexual violence, provide opportunities for personal and professional development, and host social and networking events in Lexington.